Paper 11" x 8 1/2"
Side 1 printed with 3 PMS colors and 1 foil stamped area. 20pt C1S White Semi-Gloss stock coated with Gloss Lamination. H1 business card slits on flap in left position. 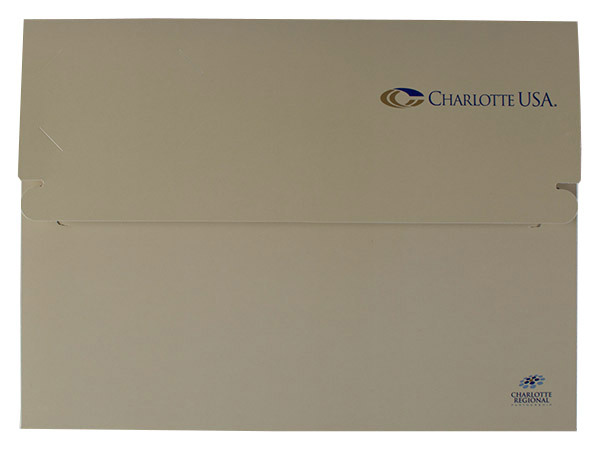 Navy letters on a pale gold panel match the Charlotte Regional Partnership's brand colors. The Partnership and Charlotte USA logos sit on the same side of the design to convey unity between the city and the non-profit, which strives for economic development in 16 counties around Charlotte, North Carolina. Contact information is on the back of the box for businesses interested in working with or learning more about the organization. Side 1 printed with 1 PMS color using light coverage. 20pt C1S White Semi-Gloss stock coated with Aqueous Gloss. H1 business card slits on flap. 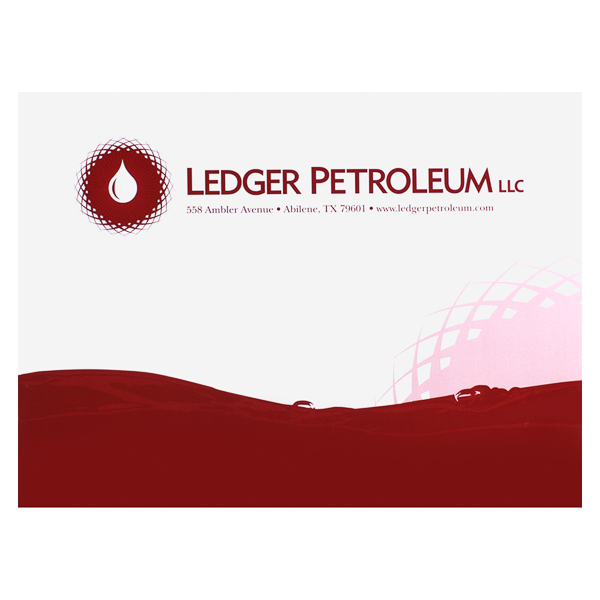 Rich red areas on Ledger Petroleum's front panel curve to mimic hills and valleys. Contact information is under the asset management firm's logo at the top of the panel for easy access. A faded, partial logo behind one of the "hills" implies a sunset. Ledger's logo appears a third time on the back panel, above the brand slogan. Four-color process printed on Side 1 of 20pt C1S White Semi-Gloss stock coated with Aqueous Satin. Clients get the impression that the sky is the limit with this presentation box from Cummins. A view looking up at skyscrapers from the street is on the cover of the box. The buildings are covered with glass windows that reflect off of one another. Both the serif font and the use of blue evoke feelings of trust and security. The back mimics the front, with the company logo on the flap. This three-dimensional product can carry up to a 1/2" thick stack of papers without breaking a sweat. 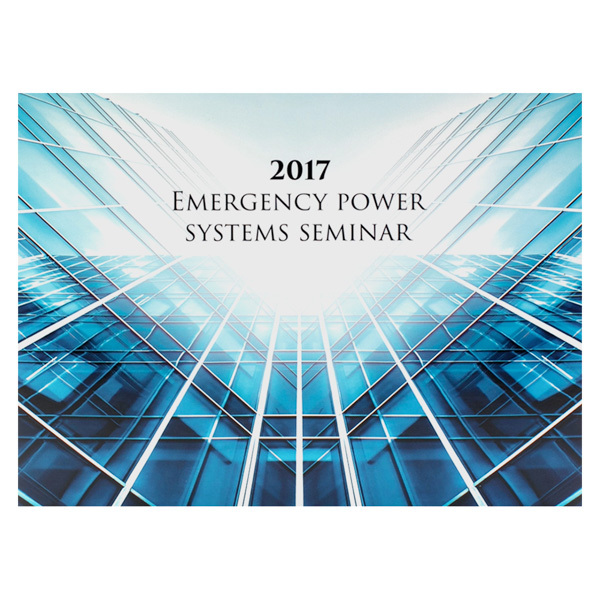 The sturdy pocket holds it shape, protecting 11" x 8 1/2" presentation packets, catalogues, or documents within its walls. Landscape orientation makes the front and back panels perfect for including photography or illustrations. Narrow top, bottom, and side walls make a great place to include smaller elements, such as your brand's name or contact information. Dimension Closed: 12 1/4" x 9"
Dimension Open: 12 1/4" x 14"
Acceptable Insert Sizes: 11" x 8 1/2"